Jim Holden is XO of an ice miner making runs from the rings of Saturn to the mining stations of the Belt. When he and his crew stumble upon a derelict ship, "The Scopuli," they find themselves in possession of a secret they never wanted. A secret that someone is willing to kill for-and kill on a scale unfathomable to Jim and his crew. War is brewing in the system unless he can find out who left the ship and why. Detective Miller is looking for a girl. One girl in a system of billions, but her parents have money and money talks. When the trail leads him to "The Scopuli" and rebel sympathizer Holden, he realizes that this girl may be the key to everything. Holden and Miller must thread the needle between the Earth government, the Outer Planet revolutionaries, and secretive corporations-and the odds are against them. But out in the Belt, the rules are different, and one small ship can change the fate of the universe. I have been itching for a good space opera, something epic, and yet limited in what humanity has achieved - humans in a type I civilization, or on the cusp of it, so to speak. When I noticed this novel among the list of Hugo Award nominations this last year, I thought I'd look into it. Once again, my intuition has struck gold, and Mr. Corey has captured my sci fi imagination and earned himself a fan. This is exactly the kind of book I like to read: atmospheric, multiple POVS, and a rich narrative that includes political, revolution, detective work, and dire situations in space, as well as depicting the mining of asteroids (which is inevitable, I think). Holden, in particular, is a character I could get behind. Sure, he has his issues, but that's what I enjoyed about him. The real fireworks, however, happen when Julie makes the scene. It makes me want to pull out my space opera again! The biggest surprise, though, was the book's size. Bigger than I thought, but it read fast. I like to think that I get more for my buck that way, and having plenty of well-played dialogue kept my attention span fixated and wanting more. Good thing there are more books! Sound like a good read to you? I'll give you a link for it. I have it on my iPad but haven't read it yet. You know I like a good space opera! Thanks for the kind thoughts when you stopped by my blog. I wrote a novella along similar lines about 12 years ago called "Waking Prometheus." I'm just saying. The Hugo nominees are always good places to look. I've found some of my favorite authors there. Huzzah for finding a great read. You know, this book has been hanging out in my to be read pile for a long time. I guess it's time to send it up the chain and actually read it. When asked my favorite genre to read, sci-fi NEVER makes the cut. And I'm not sure why. I've liked 87.5% of the sci-fi novels I've read. Haven't been in school for awhile but I'm pretty sure that's a B. And a B is still a degree! Sounds like one to add to the list to read, indeed! Hello David, always nice to meet a fellow author :) Wishing you success and a ton of readers for your new book! Sounds like a great read though I don't really read adult books. Thanks for sharing it. Sounds like an interesting read! Thanks for sharing. I'm offering a free book giveaway over on my blog! Thanks for visiting my blog and commenting. ^_^! Checking this one out. I love big books. Your review got me intrigued! Thanks for the link! Always looking for something to sweep me away. Thanks to you, I've found several books on the sci/fi side of sci/fi and fantasy that I really like. I'll always prefer the fantasy side, but an occasional space adventure is fun. I'll have to check this out. Good to meet you too David..
hope to see each other more !! Hi there David, thanks for visiting my blog. It's nice to meet you too. I love to read a good book! Wow, that book looks awesome. 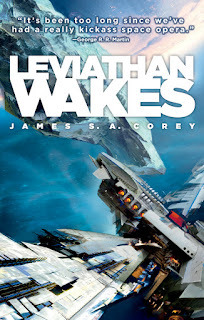 Your review seriously makes me want to read it, and I'm not a huge space opera fan, but then again I like a variety of genres. I'm going to add it on Goodreads for sure. That was a great one! I'm really looking forward to the second book.